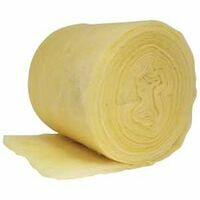 1" x 3" x 25' Foil-backed fiberglass pipe wrap with vapor barrier. Package covers 17' of 1/2" pipe, 12' of 3/4" pipe or 10' of 1" pipe. Stops sweating and dripping of cold pipes. Cuts wasteful heat loss on hot water pipes.